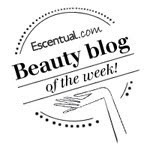 BeautySwot: Inside The August Glossybox 2014 - Glossybox is 3! Inside The August Glossybox 2014 - Glossybox is 3! It is hard to believe that globally Glossybox has turned 3, the concept of having beauty products delivered to your door monthly is hugely popular and it seems, certainly for now, that this enthusiasm shows no sign of abating. I get very excited when my postman knocks with this monthly box and this month it was no different.. The outer carton this month was black and glossy with a pink bow as shown in the pics above. The actual box has had a little redesign and is not glossy and more box shaped. As ever the items were wrapped up with a bow, this time it was a smart black colour. Very pretty. However, what is really important is the contents and this month, I personally was not disappointed. Every single item will be used. Readers of BeautySwot.com will know I pretty much wear a highlighter every day so I cannot wait to wear this one. No glitter, just a beautiful natural shade cream highlighter for a velvety gleam. I have just finished my cleanser and although I have a few others to work through I don't have a cleansing milk so will be interested in giving this a go and discovering a new brand at the same time. I can always do with a new hand cream and this one from Figs & Rouge is a fruity affair, now I am not a major fruit scent fan but this Mango and Mandarin one isn't bad at all, not overpowering and quite refreshing. The 20ml size is ideal to pop in my handbag. I was pretty sure that this has already appeared in a previous Glossybox so I checked back to find that yes my memory was correct, this appeared in November 2011. OK it was ages ago but it seems I hadn't forgotten ;-) Philip Kingsley is also celebrating this year, 40 years of Elasticizer so the tie in is rather nice. Anyway, my hair is in need of a good condition so this will be used up..just need to find a spare 20mins! Now I know that perfume samples of this size are not always appreciated but this is a really gorgeous scent and it does come with a hefty price tag...so in this case I think it was worth popping in the box. L'Amour is a truly sensational soft floral perfume with a hint of tea about it with the inclusion of Bergamot. It also features top notes of rosebuds, floral white heart notes and a musk base. Addictive. This dinky bottle contains a pretty creamy pink shade called Rose, it is very similar to a tea rose lipstick shade. I love it as a nudey easy to wear shade, you can see me wearing it in the top pic. I needed two coats to achieve opacity and smooth application. The brush is tiny but on my small nails it was ideal. This month my box was really rather good, excellent value with 3 full sized products and ALL the products will be used. The August Birthday GLOSSYBOX is £10 (+P&P) and will be available throughout August 2014 from www.glossybox.co.uk while stocks last. This month's box looks great! I've been thinking of subscribing to it for a little while, I might do it just to receive this one haha!